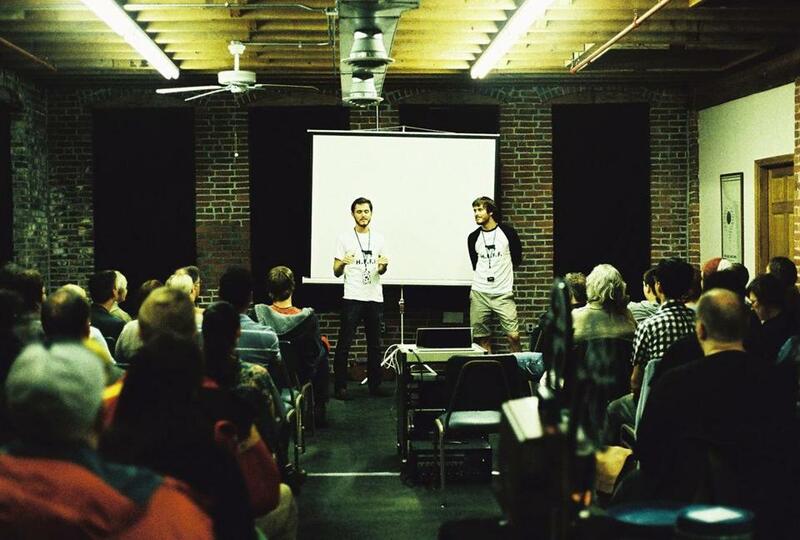 Brendan and Jeremy Smyth launched the Haverhill Experimental Film Festival in 2013. Only fearless individuals launch a film festival, especially an experimental one in a small city. But that’s what filmmakers and twin brothers Brendan and Jeremy Smyth did in 2013. The first-ever Haverhill Experimental Film Festival, billed as the only experimental film festival in Massachusetts, was such a success that the Smyths’ sophomore effort, running May 29 through June 1, is even bigger. The 2014 HEFF will run for four days and screen 57 films and videos with many filmmakers in attendance. “The city has shown [its] continued support as well, wishing us back with another grant from the Massachusetts Cultural Council,” says Brendan. “We’ve threaded a narrative theme into the six screenings concentrating on ‘Apocalypse, Post-Apocalypse, and Re-Birth.’ ” The Smyths, Florida natives who lived with their father in Haverhill for several years, now reside in North Carolina. The brothers graduated from the University of Florida as economics majors but immediately set to work on their first short documentary, “Por Dinero,” a film about a friend’s struggles while living in Mexico, that made the festival rounds in 2012. They shot their second short, “Rice for Sale,” in Bali, Indonesia. Its completion has been put on hold while they tend to their Haverhill festival duties. HEFF kicks off May 29 with a program of Super 8 films by Richard Fedorchak from 6-7:15 p.m. All screenings take place at The Barn, 90 Washington St., Haverhill. Besides many short films and video programs in competition, there are works by the 2014 jurors: Boston filmmaker and Emerson College professor Robert Todd and experimental film and video artist Soda_Jerk. These works screen May 31 from 3-4:30 p.m. Director George Koszulinski, who appeared at the first HEFF, returns with his feature documentary “Last Stop, Flamingo” (June 1 at noon). The third installment in Koszulinski’s Florida trilogy, it takes one last, critical look at the Sunshine State. For more information, go to www.haverhillexperimental.org. Takashi Murakami’s first feature film, “Jellyfish Eyes,” a family-friendly monster movie that uses live action and CGI, screens for free (with museum admission) at the ICA May 25 and 26 at noon. The film follows young Masashi, who, after his father’s death, moves with his mother to a small city in the Japanese countryside only to discover that the new apartment is already inhabited by a pint-size, gravity-defying creature. An internationally acclaimed, widely exhibited artist known for his anime-inspired aesthetic, Murakami will introduce the film via a short video message for Boston audiences in which he talks about the influences that informed his film. This screening is part of the ICA’s “First Feature” series, presenting debut films from prominent visual artists. Murakami is also well known for his collaborations in the fashion and music worlds, including work with Louis Vuitton, Kanye West, and Pharrell Williams. For more information go to www.icaboston.org/programs/film/first-feature_jellyfish-eyes. Foe more information, go to www.pbs.org/coming-back-with-wes-moore/home.